CL-30A Clarifier Discharge System 11034080 https://www.kaercher.com/us/professional/water-treatment-systems/oil-water-separation/cl-30a-clarifier-discharge-system-11034080.html The CL-30A clarifier is capable of pre-treatment, sewer discharge, or recycling wash water. With its cross-linked cone-bottom tanks, it is also an effective solids and oil/water separator. The CL-30A clarifier is capable of pre-treatment, sewer discharge, or recycling wash water. With its cross-linked cone-bottom tanks, it is also an effective solids and oil/water separator. The CL-30A wastewater treatment system is a modular clarifier that is capable of pre-treatment, sewer discharge, recycling wash water and oil/water separation. Utilizing cross-linked polyethylene cone-bottom tanks with a steep slope of up to 55 degrees, the unit delivers maximum solids separation. The CL-30A features a full open top with removable lid and a heavy duty metal stand with cradle, and also incorporates a separator top cone to effectively divide the tank into top and bottom chambers. Influent water enters the tank and through a series of processes, heavier solids settle to the bottom while free-floating oils are separated from the water and rise to the top to be skimmed and drained to a nearby oil-decanter container. The treated wastewater is then forced downward into a uniquely designed piping system where it is discharged from the clarifier. 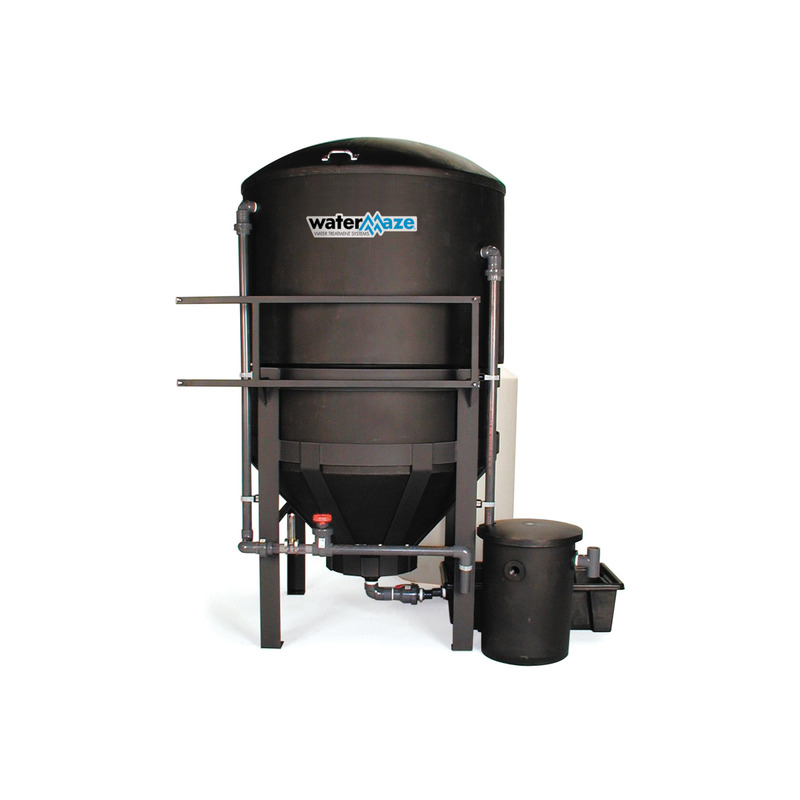 No other wash and wastewater treatment system is as versatile and modular as the Water Maze CL. The unit can stand alone or, in some cases, be matched with a Filter Pac module to serve as a solids separator, a treat-and-discharge unit or even a recycle system.